What is the most important reason for insisting on an LMT/BCTMB /AMTA certified professional? You are! Because whether you're visiting a massage therapist or body worker for relaxation, rehabilitation or rejuvenation, you deserve to be treated by a practitioner who is both skilled and knowledgeable. And that's what the LMT and NCBTMB credential stands for - a commitment to excellence. 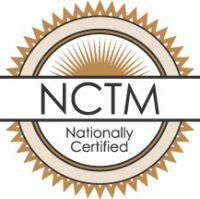 To become nationally certified, practitioners must demonstrate mastery of core skills and knowledge, pass an LMT/NCBTMB standardized exam, uphold the organization's Standards of Practice and Code of Ethics, and take part in continued education. Today, there are over 87,000 nationally certified practitioners throughout the country - and you can find them in physician offices, private practices, spas, rehab facilities, health clubs and hospitals.